Welcome to my blog on the Dreaming of Stars Blog Tour! I’m thrilled to be the last stop on this very special blog tour for Timeless Treasures Fabrics, and even more thrilled and honored to have your visit my blog today! 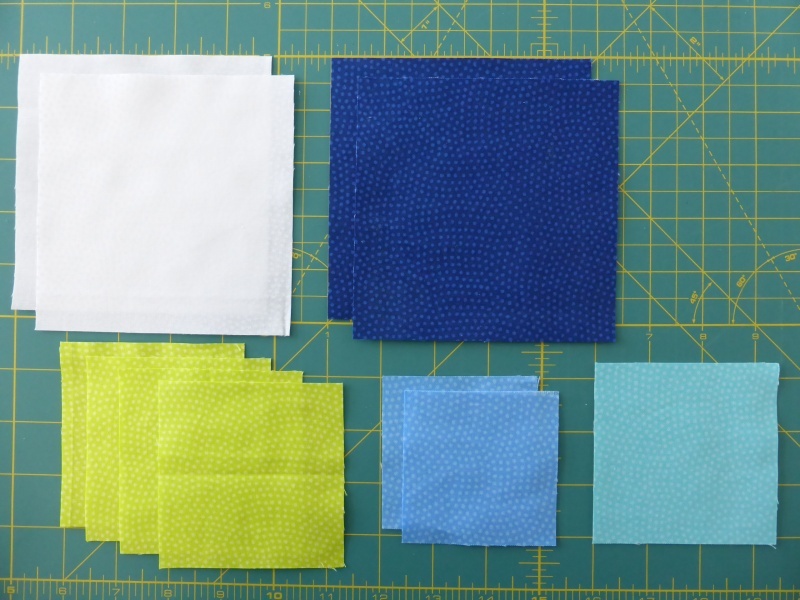 Timeless Treasures is introducing a gorgeous new line of DREAM BASIC blender fabrics. Oh my goodness, they are positively luscious! The colors are so rich, vibrant, and saturated; they really are something extra special. So, I’ve designed a very special star block exclusively for this Blog Tour, the Double Friendship Star With a Twist! 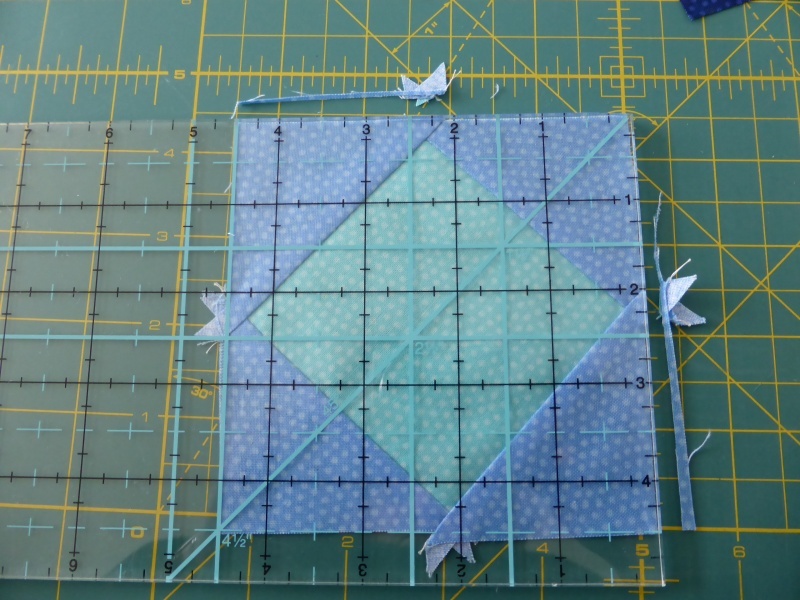 This block is fast and easy to make, and I’ve designed this block to be made using either a traditional or specialty ruler method featuring my very own rulers, the EZ Flying Geese Ruler (also known as the Easy Star and Geese Ruler) and the EZ Jelly Roll Ruler. 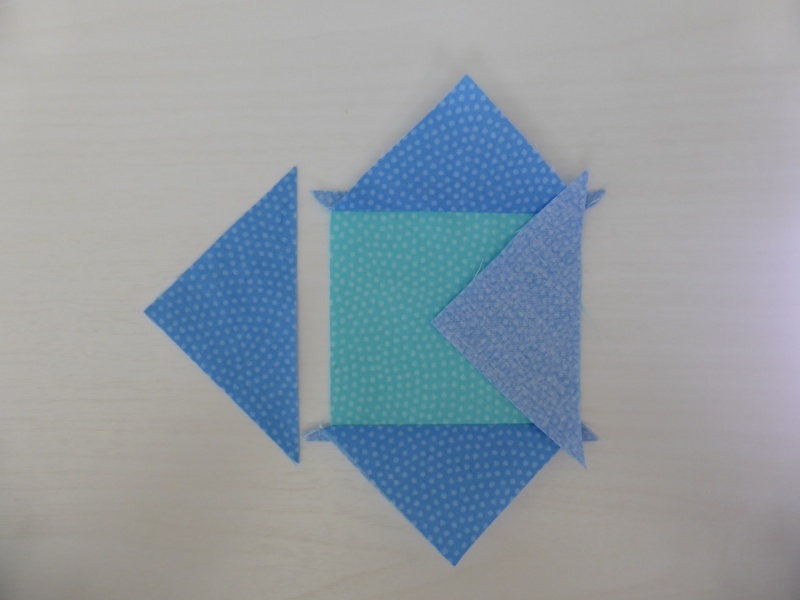 Can you make this block using traditional methods? Of course you can. I’ll show you how to make the block using both methods below. But the beauty of using my specialty rulers is quite simply, they are so easy to use. 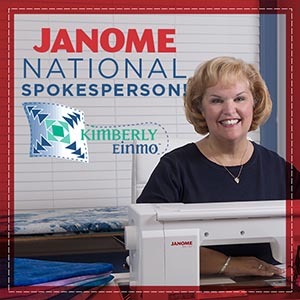 No more pesky 7/8″ measurements; everything is cut using whole or half size strips! Plus, there are a ton more ways to use these rulers beyond what I’ll demonstrate for this block. For more information on how to order these rulers, simple click on the link for the EZ Flying Geese Ruler and the EZ Jelly Roll Ruler! 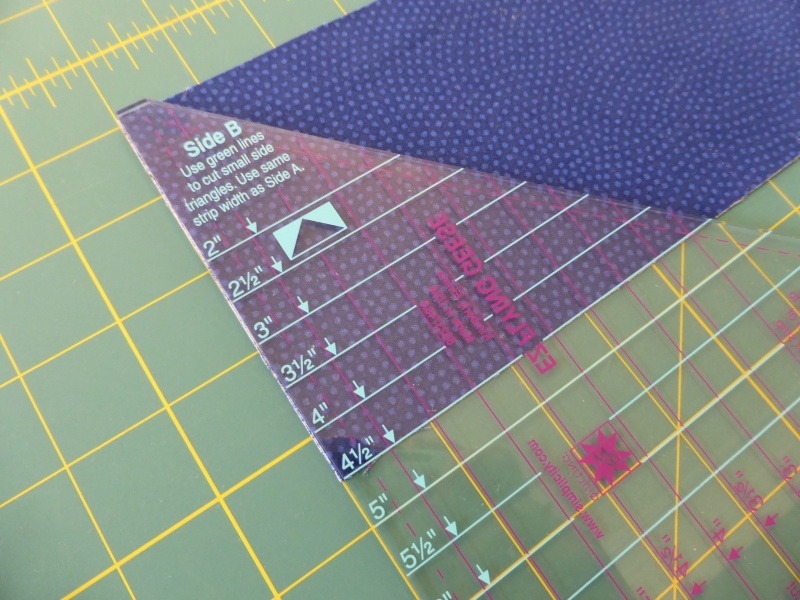 If you order the rulers, we’ll get them shipped right out to you so you’ll have them in hand in just a couple of days and you’ll be able to save time, there’s no wasted fabric and no worry or fuss about 1/8″ measurements or doing the math. 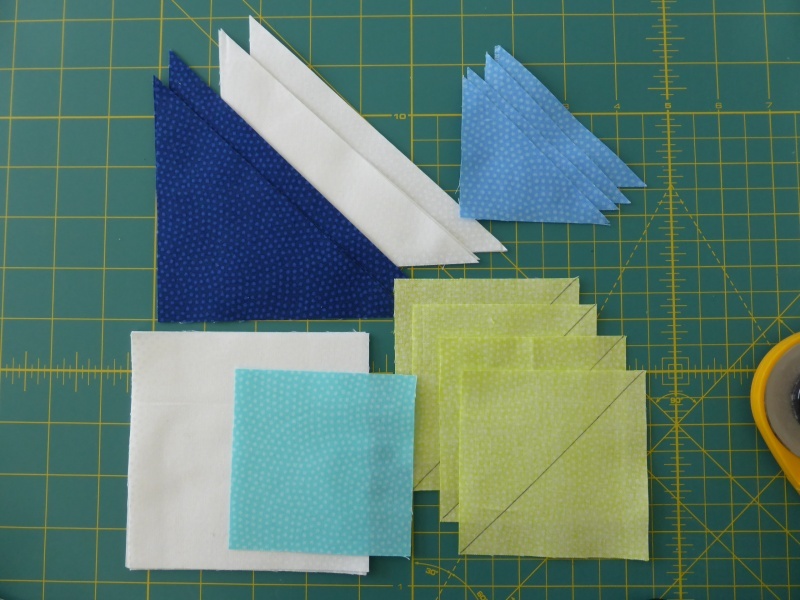 To enter the giveaway on my blog for a chance to win 1/2 yard cuts of the gorgeous fabrics I used to make my block, PLUS a chance to win the grand prize of 30 – fat quarters (one of every color in the line of TT Dream fabrics) keep reading! 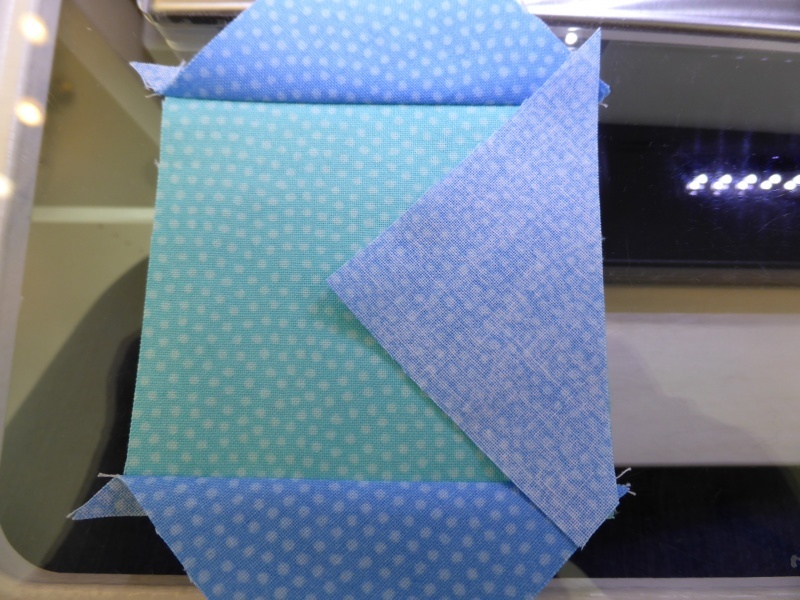 cut squares once diagonally as shown. Do this for the white….. 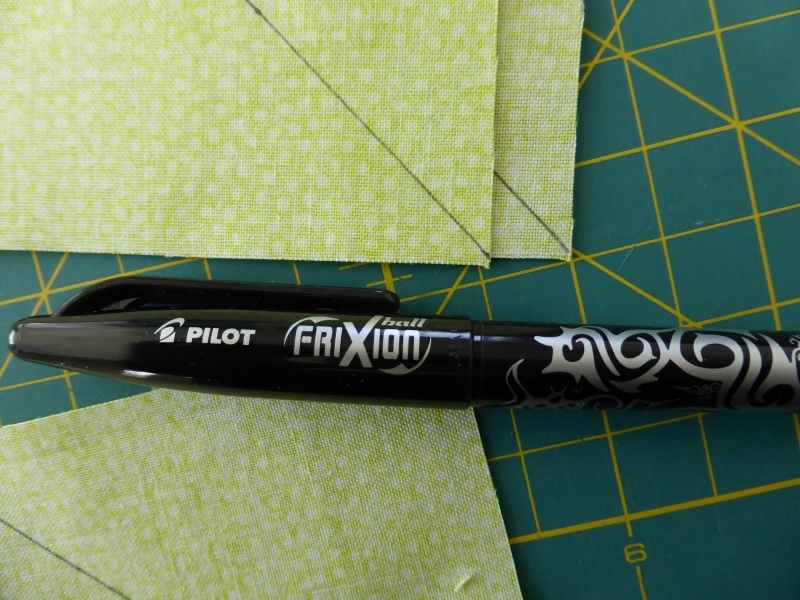 I like to use a Frixion pen (available at all office supply stores) to draw diagonal lines on my fabric. Do this on the wrong side of neon green squares as shown. 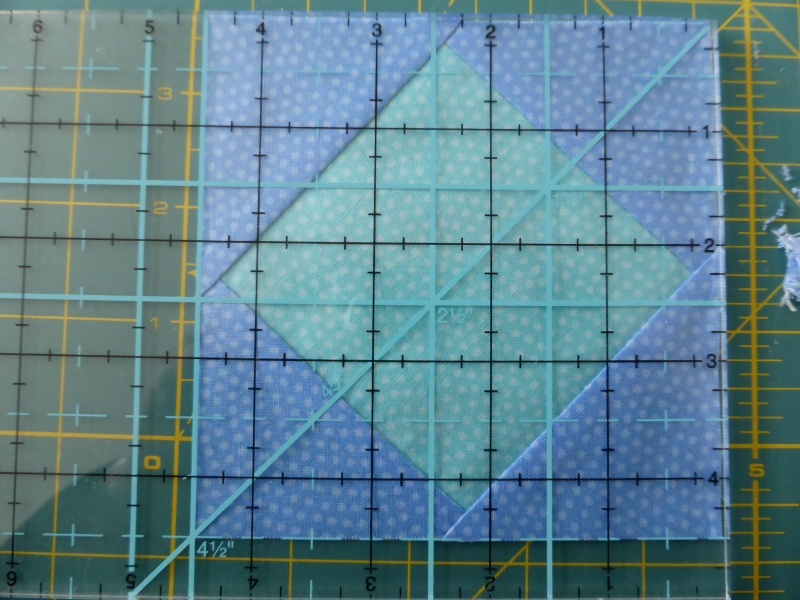 Once again, it is much easier to line up if you use the 45 degree line on your ruler with the bottom edge of your squares. 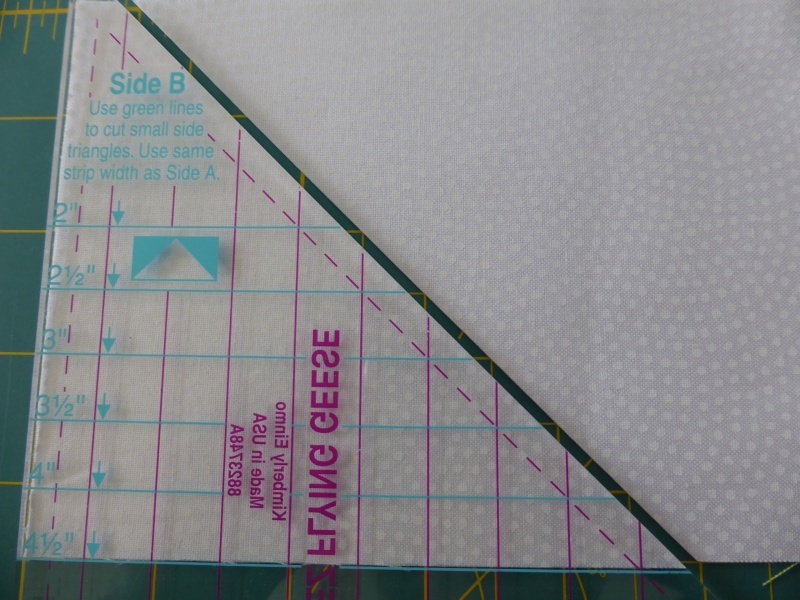 The 45 degree line is marked in bright mint green on my EZ Jelly Roll Ruler, which shows up beautifully on fabric! Now you’re ready to begin construction of your block if you are using the traditional construction method. 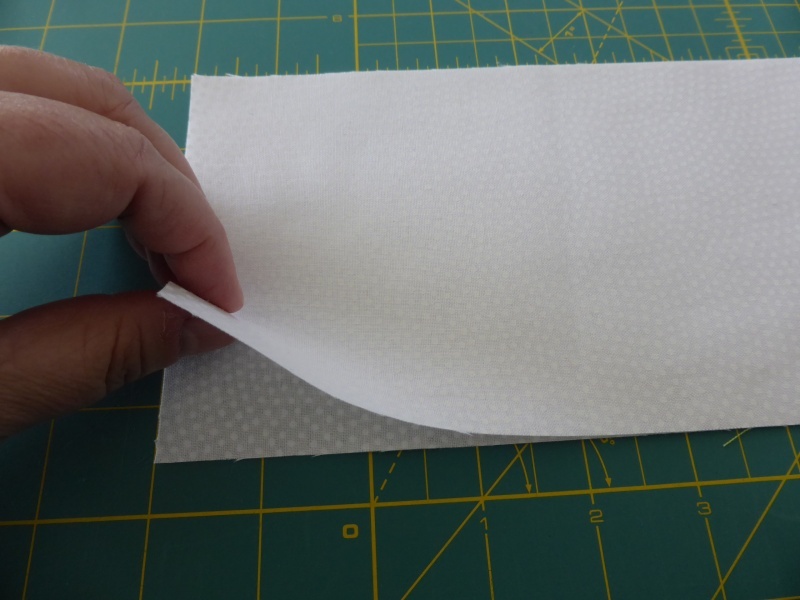 Fold the 4 1/2″ fabric strips rights sides together. 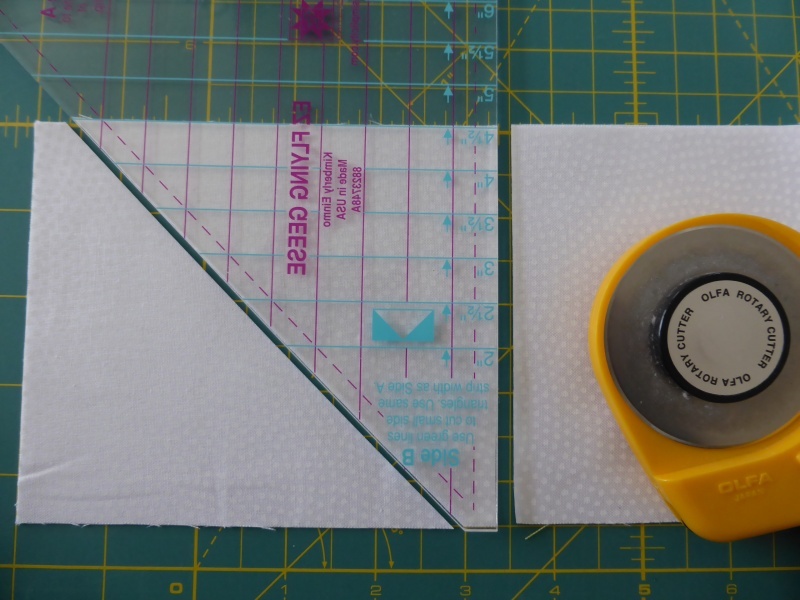 Use Side B of the EZ Flying Geese Ruler and line up the 4 1/2″ line of the ruler along the bottom edge of the folded strip. Cut. 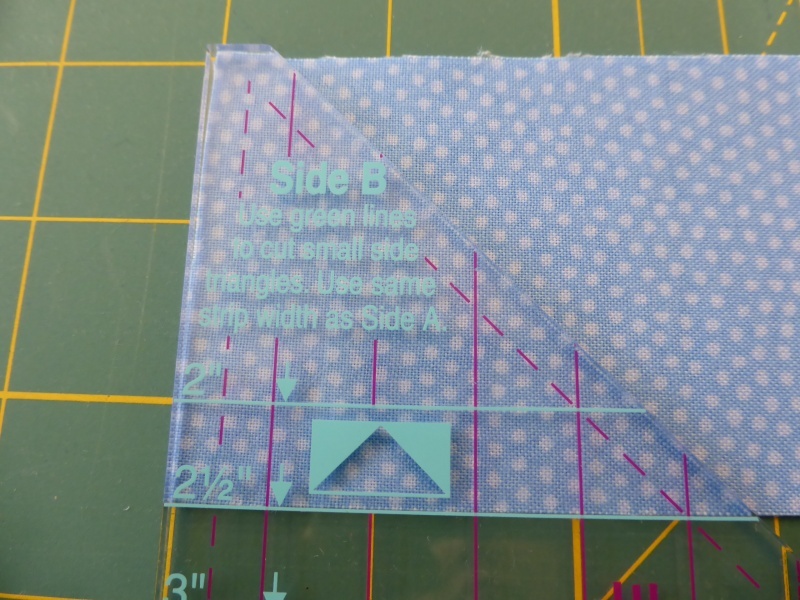 line up the diagonal edge of the ruler with the cut edge as shown. 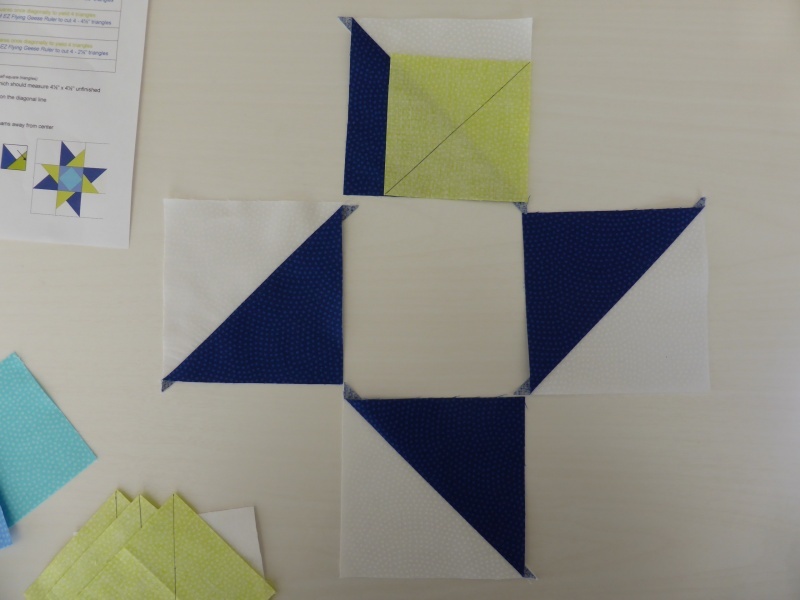 Cut a total of 4 triangles. Repeat the process for the 4 1/2″ royal blue strip …..
….and the 2 1/2″ delft blue strip. 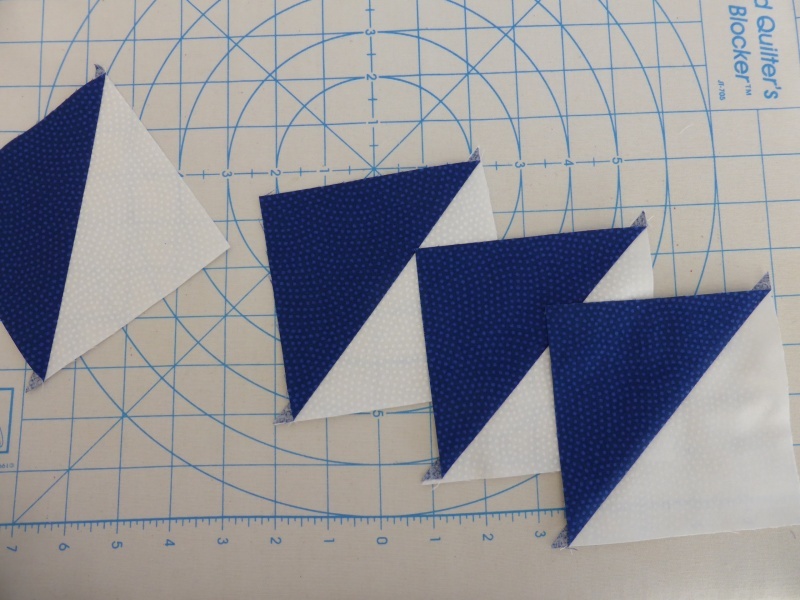 Cut a total of 4 royal blue and 4 delft blue triangles, as shown. 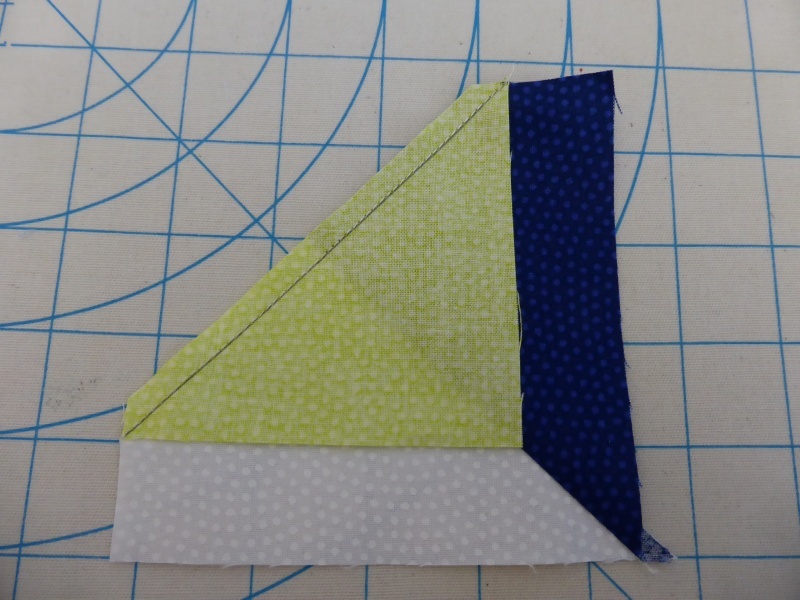 Each triangle should have one lopped off point. 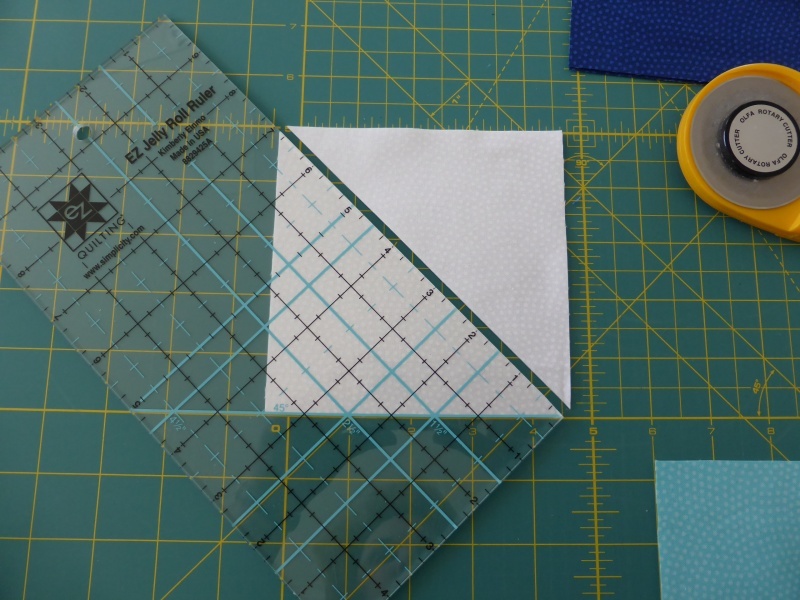 Now you’re ready to begin construction of your block if you’re using the specialty ruler method. 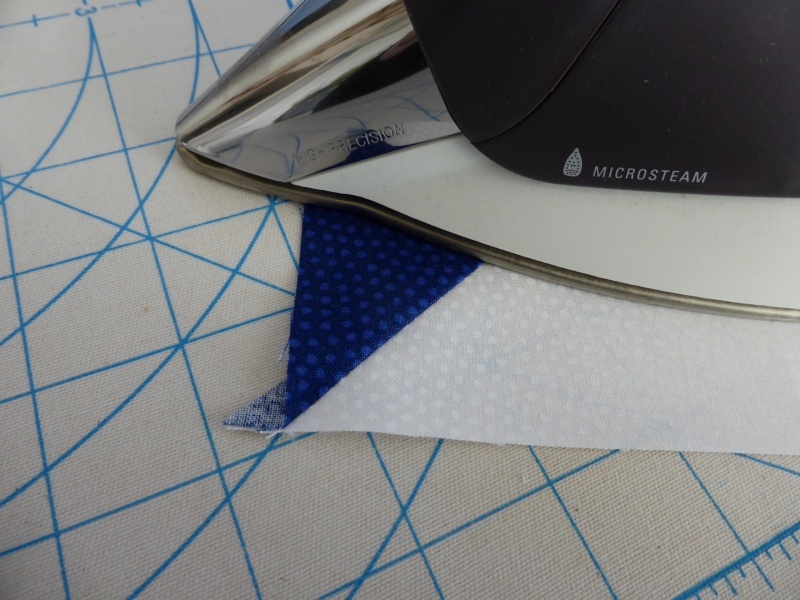 With right sides together, sew a white and royal blue triangle together along the long side to make a half-square triangle (HST). 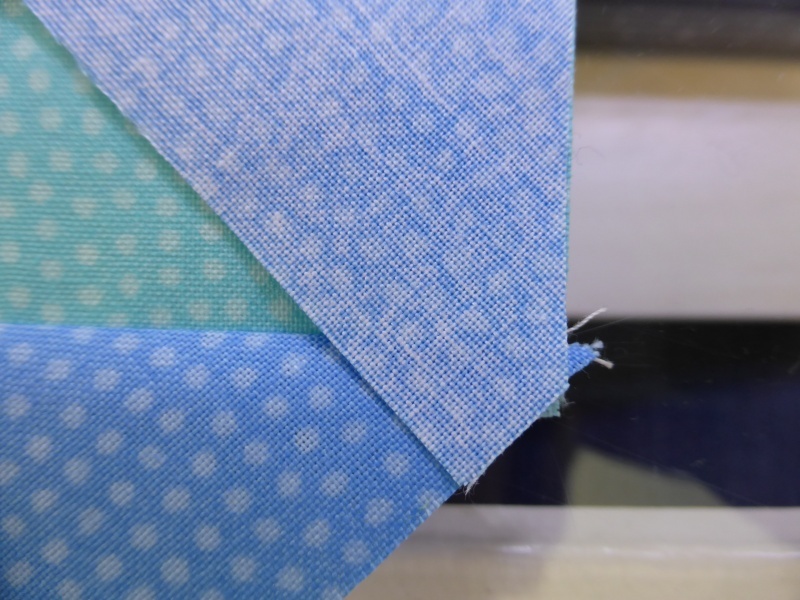 Press seam toward blue fabric. 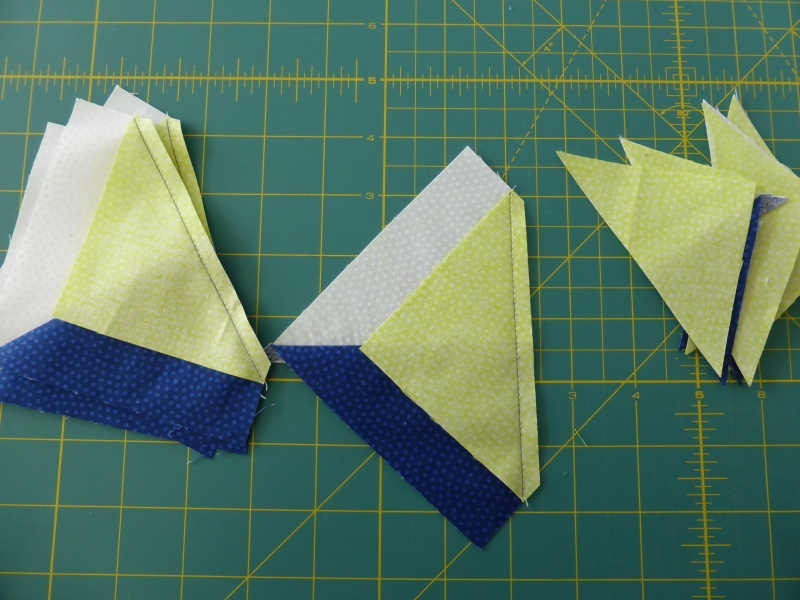 Make a total of 4 – 4 1/2″ unfinished HSTs. 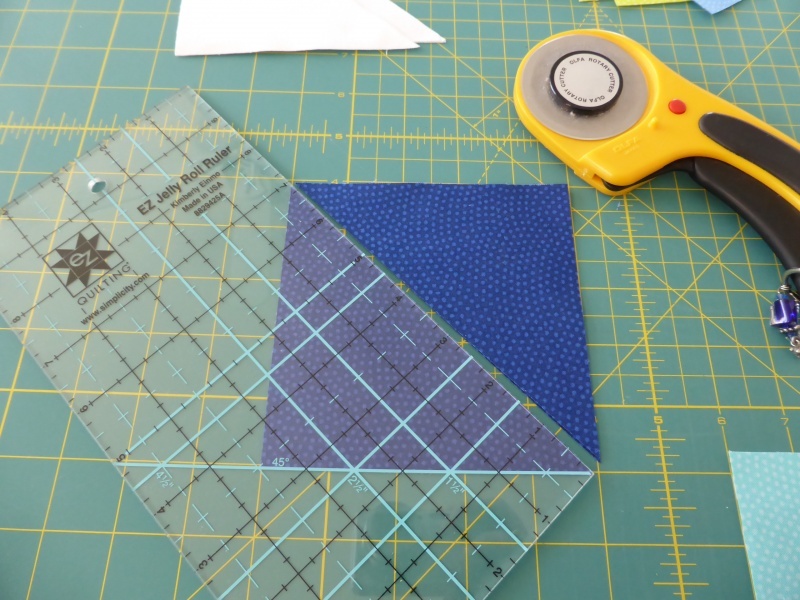 HSTs should measure 4 1/2″ x 4 1/2″ unfinished. Lay out the star points as shown being careful to keep them in the proper orientation as shown on the .PDF handout. Add the neon green squares with the drawn diagonal line as shown. Stitch on the drawn diagonal line. 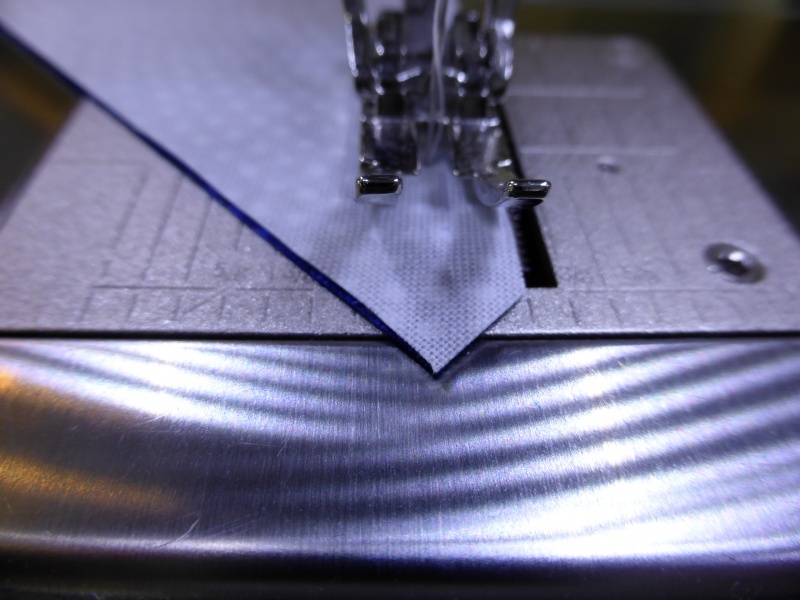 Line up your ruler with 1/4″ marks on the stitching line. 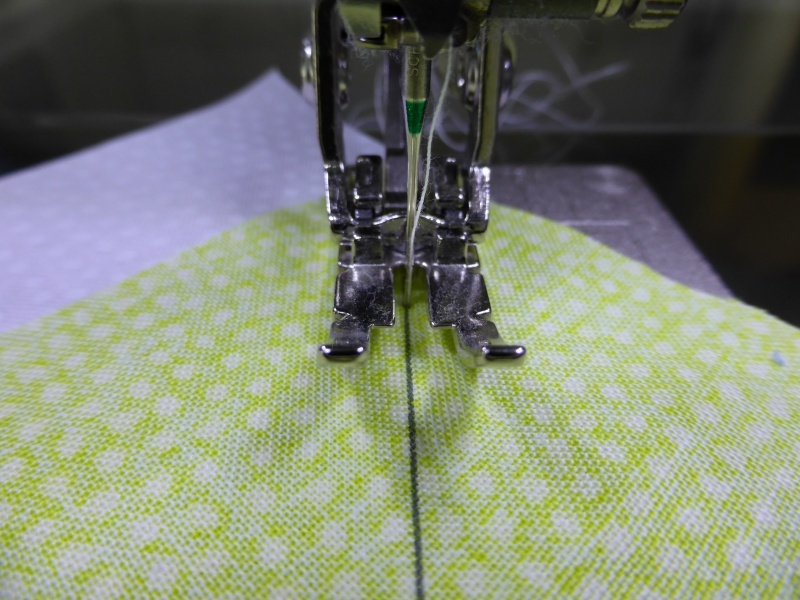 Trim 1/4″ from the stitching line as shown. And don’t worry about that drawn line if you used a Frixion pen. 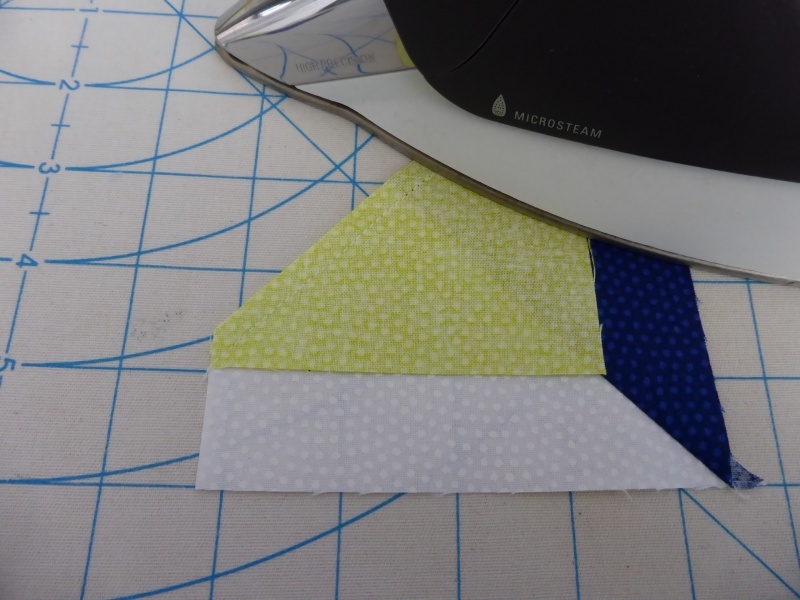 Press the seams towards the green triangles. If necessary, square-up the units to measure 4 1/2″ x 4 1/2″ unfinished. Be sure to trim all remaining dog ears! 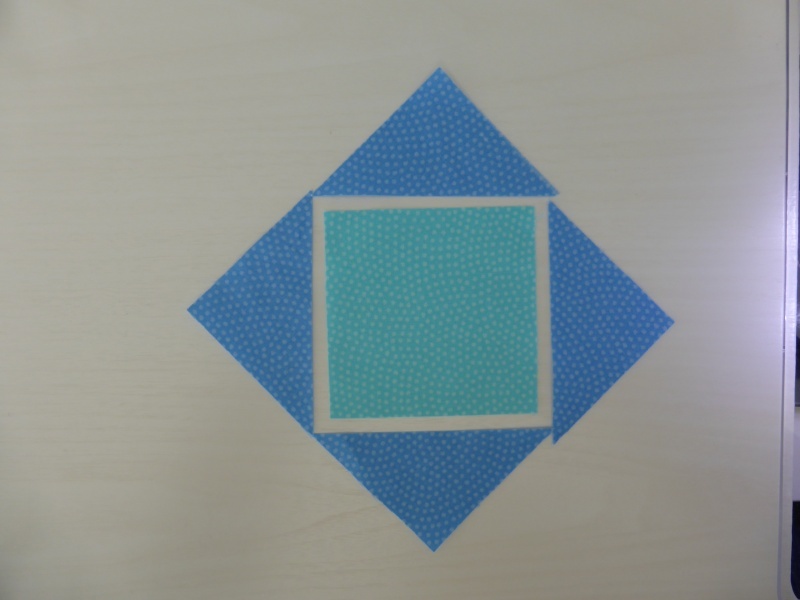 Lay out the aqua square and delft blue triangles as shown. 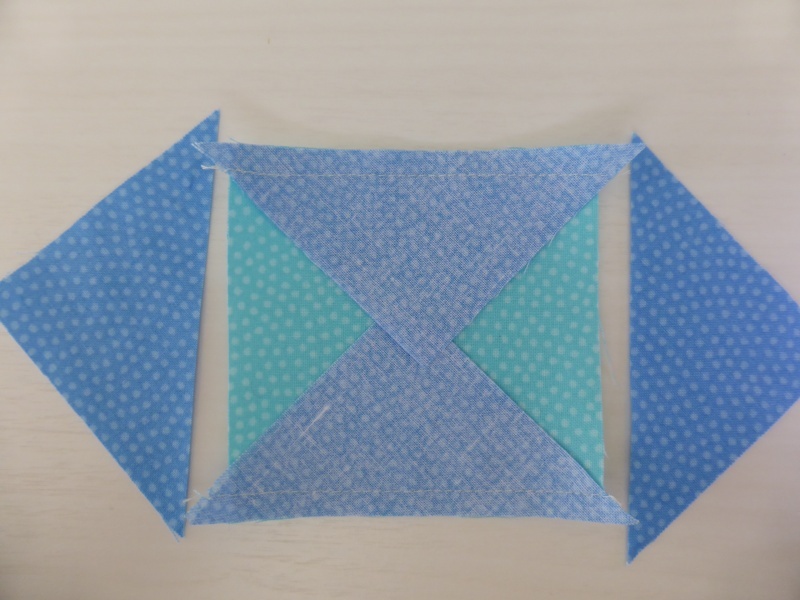 Stitch opposing sides to the aqua square. 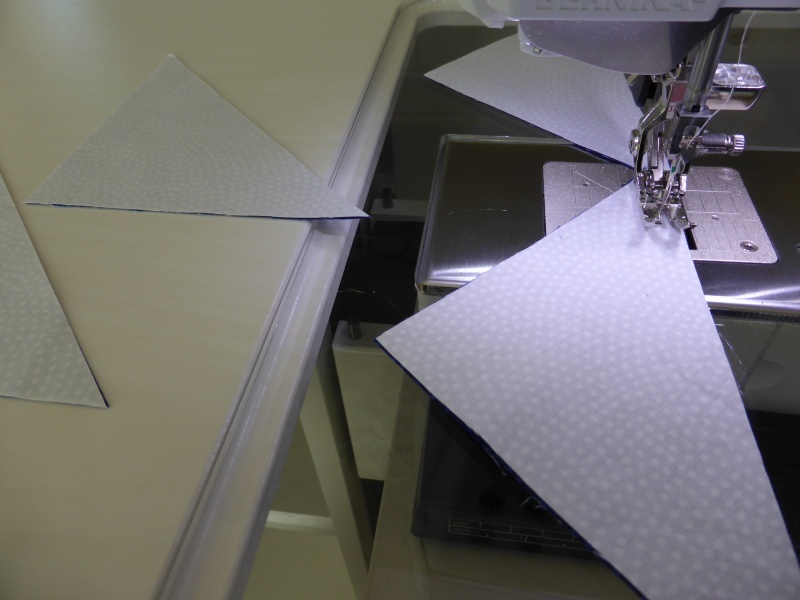 Press seams outward, toward the triangles. Add the two remaining triangles. 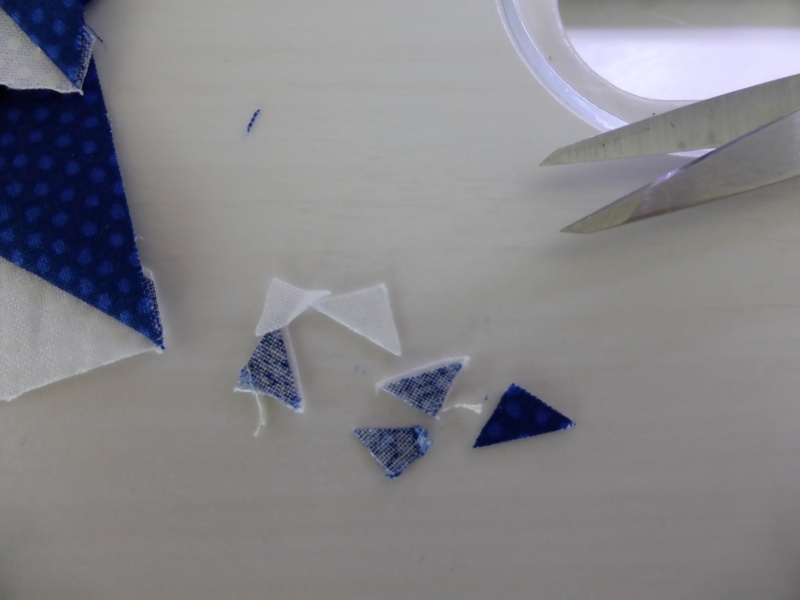 If you are using the specialty ruler method, your delft blue triangles will have a lopped off edge. 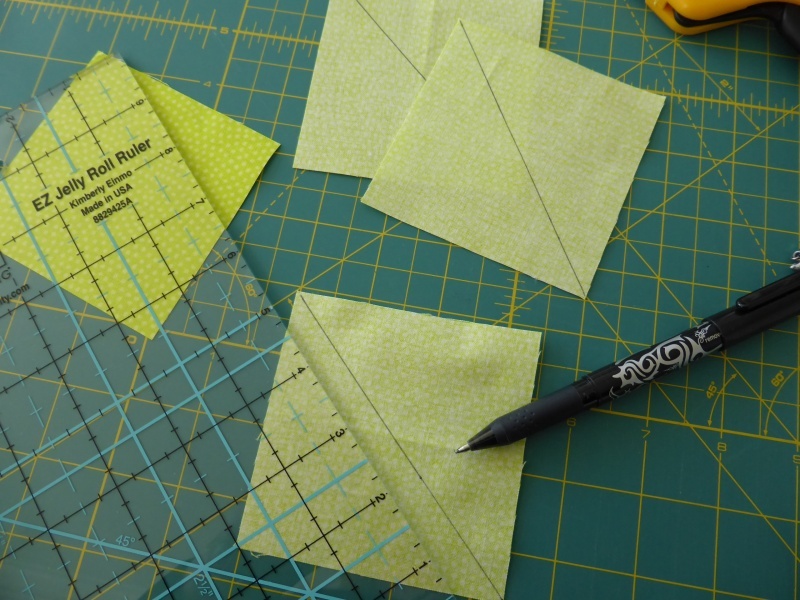 This lopped off edge lines up perfectly to give you the perfect 1/4″ seam allowance. 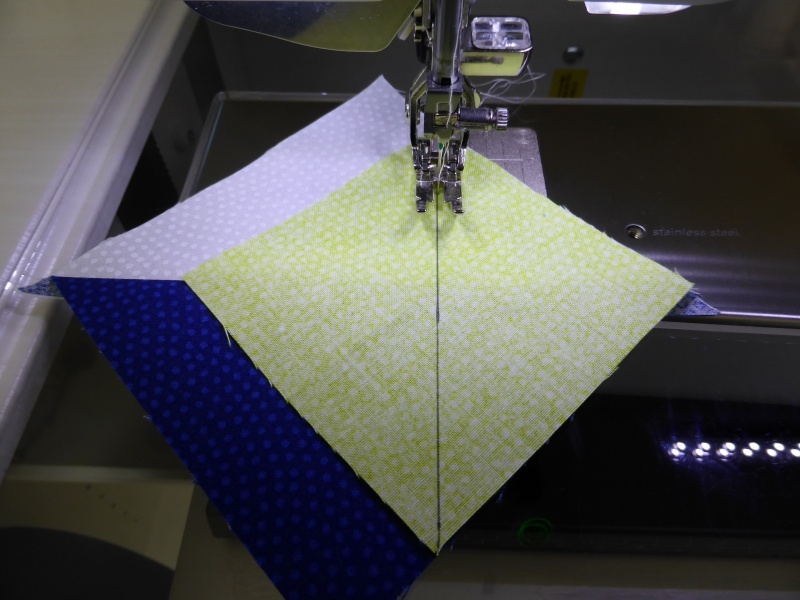 triangles exactly with your center square and when making your HSTs. the small schniblets of thread and pesky dog ears. Lay out your units making sure you have your star points aligned correctly. …..and viola! You will soon have a beautiful double friendship star with a twist! Honestly, I had so much fun designing and sewing these cute stars, I couldn’t stop! Within a little over an hour, I had made four blocks! whether you choose the traditional or specialty ruler method! I just love using Timeless Treasures Fabrics. They are not only beautiful, but the weave and “hand” of these fabrics are simply divine to stitch. In fact, I used a variety of Timeless Treasures fabrics to make many of the new quilts featured in my soon-to-be-released, 5th book (published by the American Quilter’s Society), Modern Quilts & More! Right now, you can pre-order a copy of my new book and be one of the very first to receive a signed copy when they are released in February or March, 2014. Click here to place your order! And something else fun I’d love to share with you all….my newest quilt, Fire and Ice, won the Viewer’s Choice Award in the Modern Quilt Challenge sponsored by AQS last October! I was absolutely thrilled to have been awarded this special ribbon because so many viewers loved this quilt! I designed and sewed the top using Timeless Treasures Java Blenders and the quilting was masterfully done by Judi Madsen of Green Fairy Quilts. 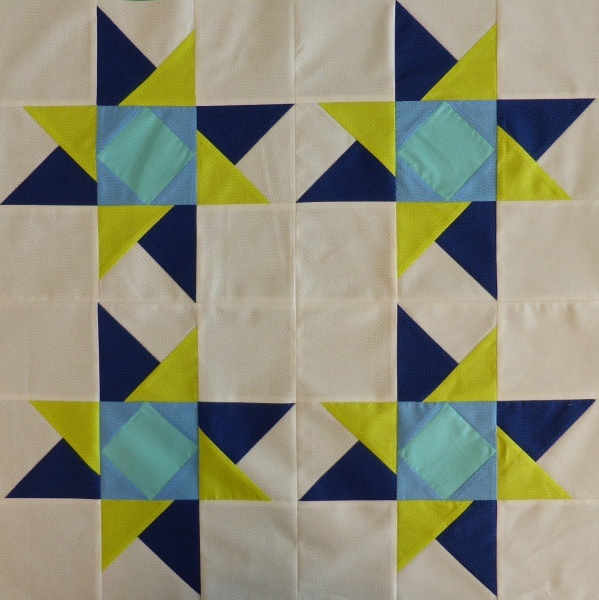 Simply leave me a comment here on my blog and tell me which is your favorite color or star block. I’ll choose a winner at random on Friday, January 24th to win a fabulous 1/2 yard bundle of the five luscious colors I used to make my Double Friendship Block with a Twist! including white, royal blue, neon green, aqua and delft blue. And all you have to do is click HERE to leave a comment to enter to win the 30 piece fat quarter bundle of ALL the Timeless Treasures Dream Basics Fabrics! If you’re a new visitor to my blog, I hope you’ll check out my website and become a new follower. And please look for me on Facebook as well. 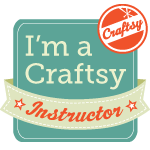 I also have three classes on www.Craftsy.com you might want to check out. Click HERE to get a special discounted price on those classes! I’d love to hear from you — and I’d love it even more if you’d make the Double Friendship Star Block with a Twist and come back and share a photo of your block with me! Thank you so much for stopping by today. My favorite color is blue and my favorite star block is the feathered star. Kimberly, I knew you when….. I love all you have done since those days in Germany. Congrats on the Fire and Ice award. 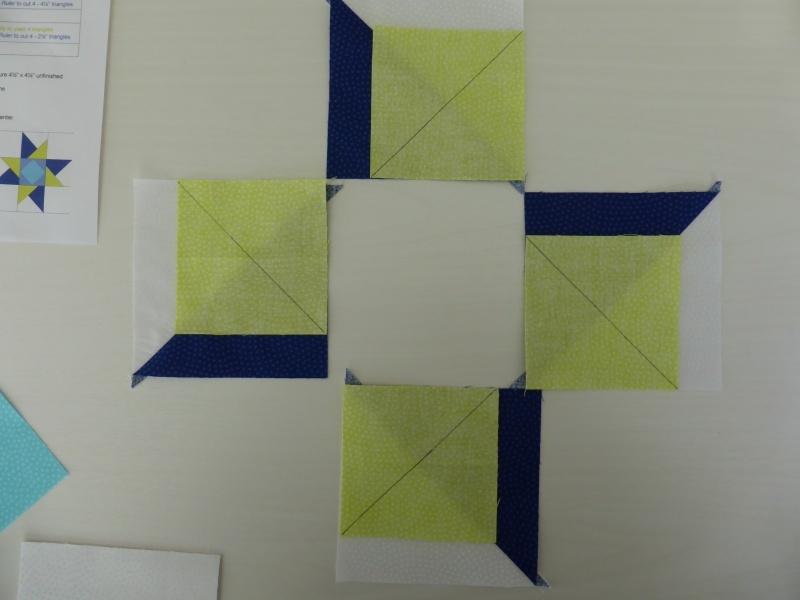 I am in a block exchange where we will be doing 12″ star blocks in black/white/gray. 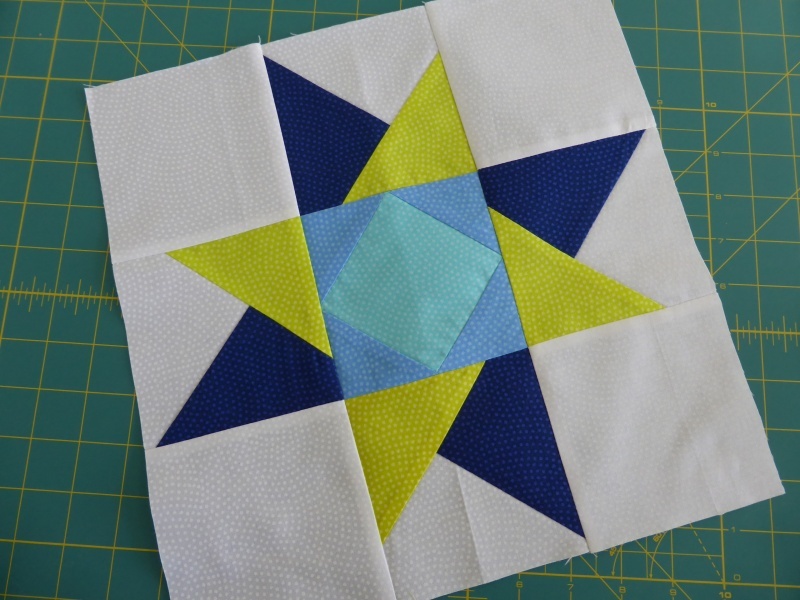 I think I just may use this star because it has a center square where I can feature a fussy cut print. I like your colors much better though – that delft blue is my fave! I love them all but the delft blue is my favorite! Love the blocks! I am not sure what my favorite color would be! 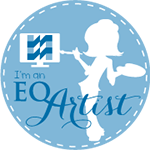 I love to use them all and can’t tell from my quilts what I use most, lol! I love your star and the color combo. Kimberly, it has been such a pleasure knowing you all these years, remembering when we first met in Germany, I feel we have a special bond for reasons you know, our journey has been a success. I enjoyed reading your blog and seeing you grow in so many ways. I love most any star pattern and blues and yellows are my favorite colors. I love following you. I think I would like the star in Batiks. May do this in the next couple of days. We are expecting horribly cold weather and I think staying in and quilting (and maybe baking) would be the perfect way to spend my time. Today’s favorite color is Rust paired with orchid! I love all of them! You make it look so easy–something I really appreciate! I’ve really been loving teals / aquas lately! Thanks for the awesome giveaway! My favorite color is blue. I love feathered stars, but have not made any! I think it’s time that I try it! I love how you gave instructions for BOTH ways of making the block – traditional and specialty ruler! You go the extra mile! It is beautifully done – both the block and the instructions! Thank you so much! I love this Dreaming of Stars Tour! And your Craftsy classes are very cool altho I haven’t been on for a while. When I retire I hope to have more time to watch Craftsy and quilt and have fun! Right now, full time job takes up way too much time!! 🙁 Love you my Dear! Kimberly – I am so happy to have met you through this blog tour, this block is just lovely and I am excited to look in your shop now at your books and the flying geese ruler that you make – I have been needing one forever! 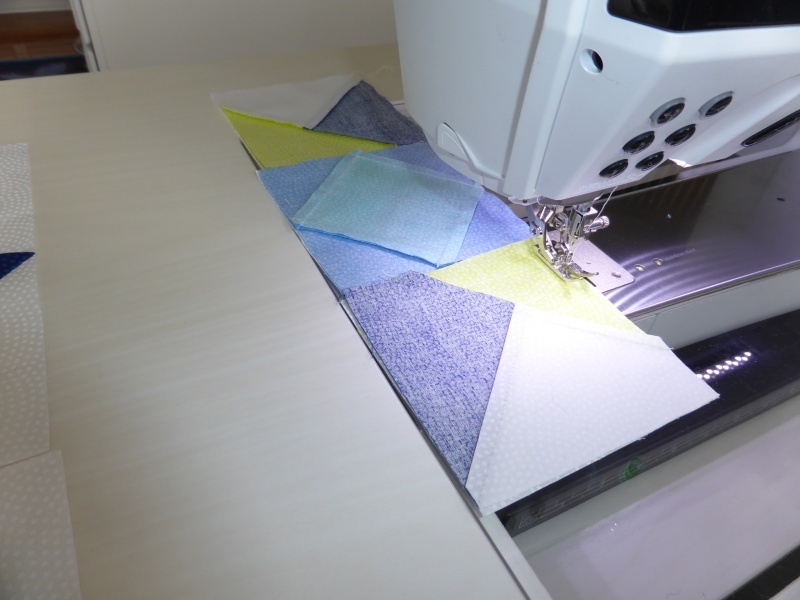 You are so talented and your blog is so enjoyable to read – happy sewing friend! I love the purples and blues in this line. They are so vibrant and saturated with color. It’s so hard to choose my favorite…but if I have to…probably the dream star. Thank you!! I am loving purple these days. This may change tomorrow, but for right now I love purple. My favorite star block is the milky way star – love the way they look when you put a bunch of them together. My favorite color is blue. I love friendship star and make it often. Your double star is a pretty change I’ll have to try. I love this block, Kimberly. As usual the colors are great. I love your color sense. The Friendship Star is the best. I love your blog and all you post to it. I don’t follow blogs, but this one I am. The tutorial is great. Thank for the inspiration and instructions in two methods. The blue and green are both favorite colors. I really love blues, and I think the dream star block is my favorite! Can’t wait to try this, you have made it look so easy. This is such a versatile block and can be easily color coordinated for any room or color scheme. Thanks for sharing and giving us the opportunity to win the fabric. p.s. my favorite is the paper pieced block. My favorite color is green & my favorite star block is the friendship star. I love your double friendship star – thanks for the tutorial & the chance to sin. I love your ‘fire and ice’ quilt – stunning! This line of fabrics is awesome and the possibilities are endless. I do like your block! the beautiful double friendship star with a twist………is my favorite. The Royal blue fabric is awesome…..and the Yellow…….together are just beautiful! I have your Craftsy Course….Magical Jelly Roll Quilts……and your book, Jelly Roll Quilts. You are a fabulous instructor and author! 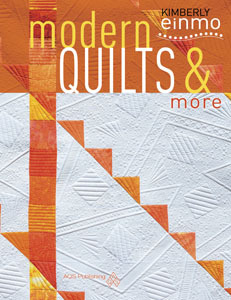 I will be ordering your new book……Modern Quilts and More. My favorite color is pink, any shade. I just made my first Martha Washington Star block, a new-to-me variation on my favorite Sawtooth Star. Can’t wait to try your Double Friendship Star with a twist! I really appreciate your instructions for both methods. My favorite color is deep red. My favorite color is gold. And my favorite star is the Friendship Star. Dear Kim, Dee sent me to your web site. Love love your design and colors. I would be thrilled to be considered the possibility of winning. I love the blues, aqua and green, but can see how fun this would be in red, pink yellow and purple. I will follow you. I love your block! If I had to choose just one color, it would be aqua. Thanks for the great tutorial, I will have to check out your rulers. My favorite color is purple…any shade. I like all the stars but leaning more toward the paper-pieced one. Thanks for the tute (both methods…awesome) and the chance to win. From the tour, my favorite block was from Day 2 which is an unnamed block. She asked for name suggestions and mine I gave it was Braided Dreams. I really love the block. My favorite color is the Purple. It’s a gorgeous shade. Your Fire and Ice quilt is absolutely gorgeous. I can totally see why it won. I love the Double Friendship Block with a Twist and I’m thinking the center block could be signed by all my guild members. Thank you for always giving us inspiration. P.S. My favorite color is turquoise, but I also use many of the primary colors in my quilts. Your block looks super, and I agree the Dream Basic fabric is pretty nice. I like the saw-tooth star. Thanks for the great tutorial. Fire and Ice… WOW! My favorite color is green but purple is a close second. I’m loving this blog tour! Those bright greens are my particular favorite, and I love your star best. The neon green rocks the block!! Thanks what a great tutorial btw! Nicely done! I like odd shades of green. Like the one in your lovely star. Your block is very cute. I’m going to share this one with my quilt guild. I think it would make an excellent exchange block. And your quilt is beautiful – definitely deserves the award you received. Lime green is the new yellow as far as I am concerned – gives a perk to almost anything. I definitely am loving that deep royal blue that you used for the HTS. My favorite star block of all is the Lone Star; the LeMoyne would be a close second. My favorite color is green… the off shades, lime/olive/forest…. Love all of the stars! Thanks for participating in the tour. Double Congratulations on your upcoming publication and Viewers Choice Award. I would love to see this in real time (the photo is beautiful). Shades and values similar to Radiant Orchid: PANTONE 2014 Color of the Year are what I gravitate towards. Congrats on your new book and your View’s Choice Award – you must be elated! To answer your question, I don’t know if I have a favorite star block per se but have enjoyed making wonky stars in the past. 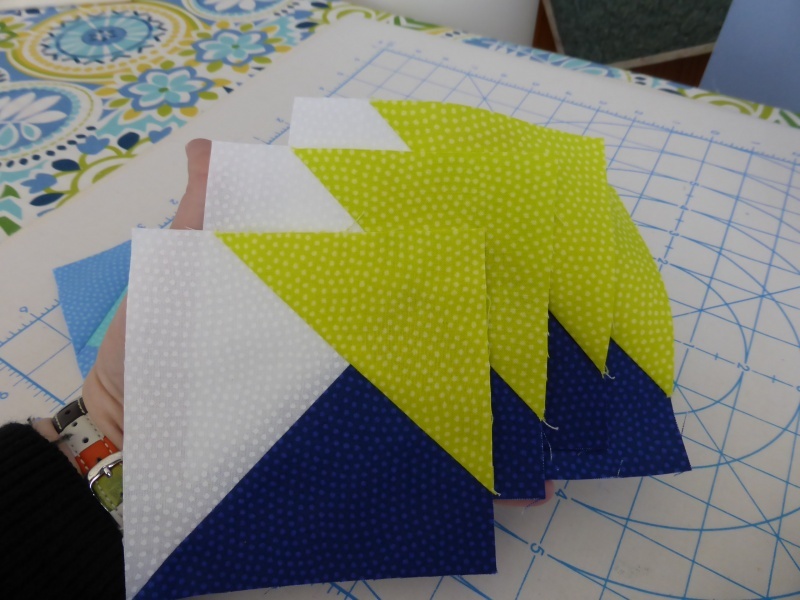 I enjoyed Ms. Nyberg’s wonky Patriotic block – how cool was that! Thanks! I love the dark blue fabric. Need some right now to finish a quilt. The tour was fun and thanks for showing all the different methods. Love all of the stars especially the Double Friendship Star with a Twist. I like how you put 4 of them together! I really like red and green. I’d love to make the Double Friendship Star with a Twist with yellow, orange, red and purple! My favorite color seems to change with my mood. Today I will say blue. Thanks for the chance to win. 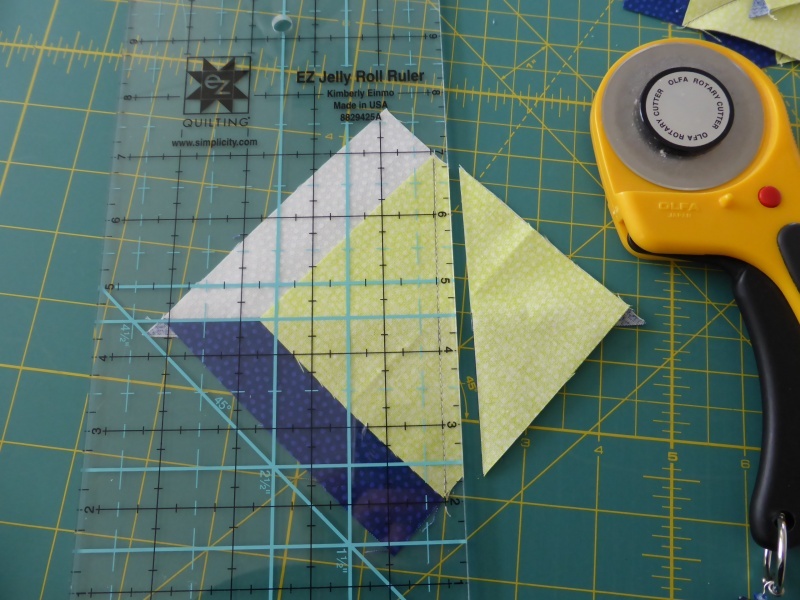 My fave color is green and I love all of the paper pieced stars by Julie Hirt of 627 Handworks. Your fire and Ice quilt is absolutely gorgeous – congrats on the win! This star makes my eyes dance! I love it!! Kimberly, I really like your Double Friendship Star with a Twist. I will have to try this one soon. My favorite color is Purple, however lately I’ve been going more for Burgundy and Mauve. I have the Flying Geese ruler from our Alaskan Cruise in 2010, however would be interested in the jelly roll ruler. I am also going to pre order your new book. Congratulations on Fire and Ice, winning the Viewer’s Choice Award in October!!!! 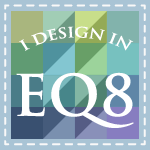 All the star blocks are so creative….what really captured me is your Fire and Ice quilt! Your block is so pretty, love those colors too! Thanks for the chance to win! Love the Lone Star block, and am currently loving Caribbean colors! From your block, it’s the dark blue that does it for me! All the blocks are wonderful and as far as colors go, lately I’ve been drawn to neon greens. 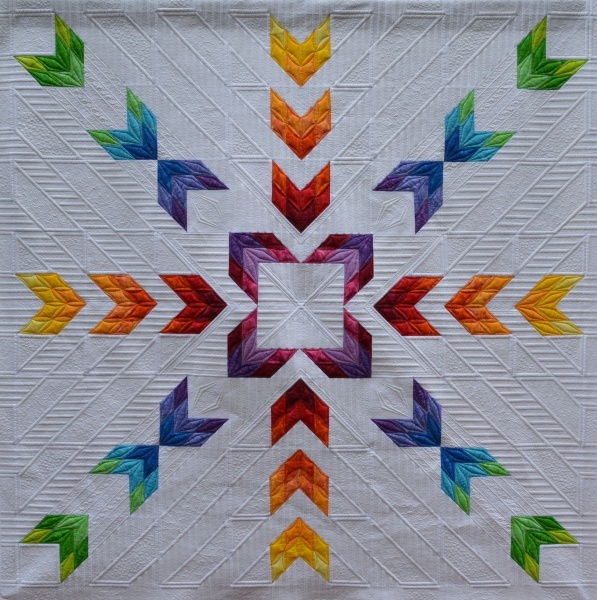 By the way, your Fire and Ice quilt is just stunning and congrats on your newest book! Lovin’ orange these days. And all your designs. 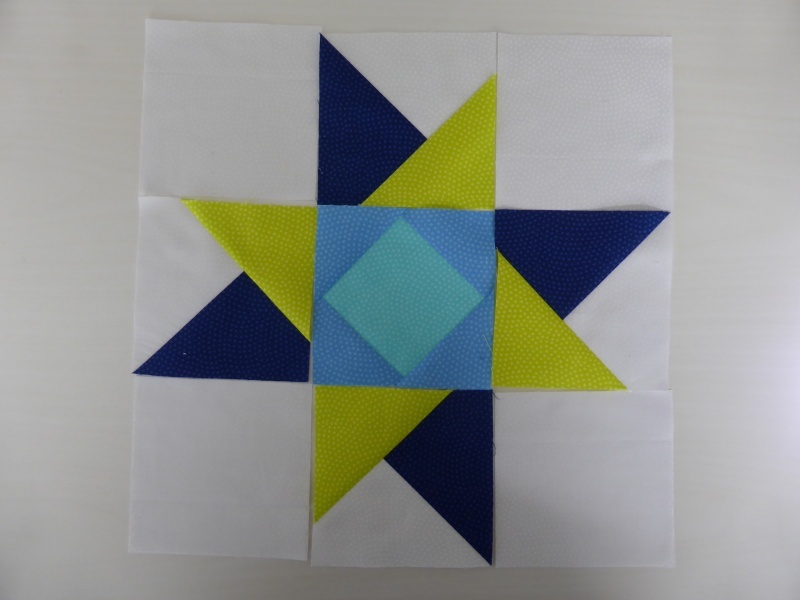 My favorite color is blue and my favorite star block is the Sawtooth star with 4 patch or pinwheel centers. Thanks for sharing your block and tutorial. My favorite color is grape. Thanks for the beautiful block! Great block! I love the twist. Really neat looking!. Favorite color is blue and purple! My default is gold with navy, but that neon green is too cool! At the moment, the 54-40 or Fight block is my favorite because i just finished Bonnie Hunter’s new mystery quilt Celtic Solstice and I do love blues and purple. My favorite color in your block is the neon green. I love how this block spins! And your fire and ice quilt is absolutely awesome. I follow your wonderful blog on Bloglovin. Thanks so much for sharing! Love the block. I don’t like neon green but in this block, I love it. Really sets it off. You have made this look so simple. Thank you for showing this – think I can do it now. I’m always drawn to blues. I’d like to try your block. My favorite color is red and my favorite star block is the Ohio Star. I love all the colors but I have to admit the Neon Green and Delft Blue is my favorite. I also your quilt Fire and Ice. Congratulations on the award for it. Thanks for sharing and the giveaway. I love blues and purples in my quilts. I really like your star block with the two different sizes of star points. I can’t wait to start this block. I love that you gave two different directions. Thanks for coming up with wonderful ideas and are easy to follow. My favorite color in the block is the Aqua. Congrats on the Fire and Ice award. It’s truly an amazing quilt. I love the colors in it! My favorite color is the Delft Blue. My favorite block is the Feathered Star. Love the Fire and Ice quilt! I love all of the blocks, but I think I like your friendship block the best of the 5. I can’t wait to try it using reds, oranges, and yellows! I love blues and aquas. 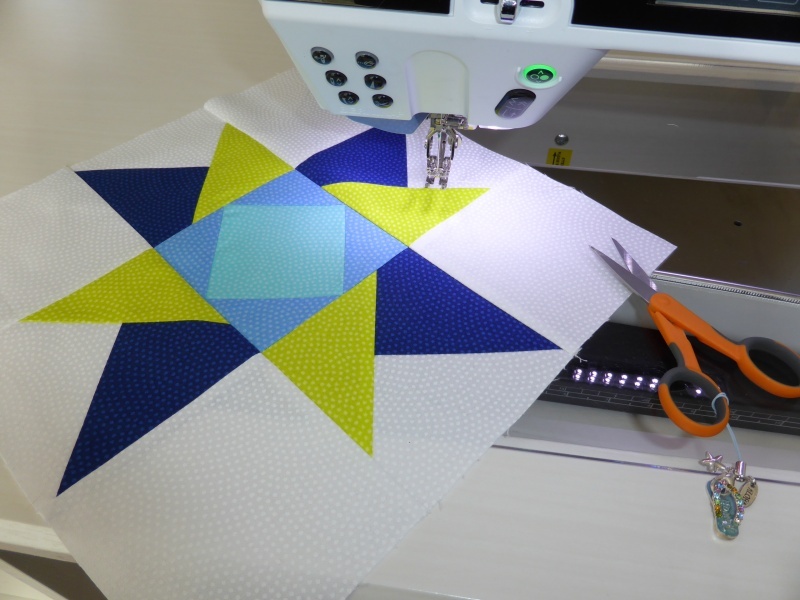 The Friendship Star you made with these fabrics is great. Love the colors and the twist. Double friendship star with a twist in greens and blues is a great motivator. First time blogger and now I am hooked. Love your Fire and Ice. So very, very nice in all my favorite colors. My favorite color is green and I like the Ohio star block. I love reds. My favorite star block is the Friendship Star. I “liked” this post on Facebook. I’m not sure if that is the same as “sharing”, but I tried! My favorite color has always been pink! My favourite colour is red. You didn’t say if the giveaway is open internationallly or not – I’m in the UK. My favorite color is blue and I love your block. I love the twist on the traditional star block. What a beautiful block and a great tutorial. I’ve certainly been interested in your EZ Jelly Roll Ruler and this post just inspired me more. Hmm. Favorite star block? What a difficult question as I love them all. LeMoyne Star, Friendship Star, Mariners Compass, etc. Congratulations on your upcoming new book. Looks like it is going to be an amazing book, but I will say you are such a tease….difficult to look at it and not be able to check it out now. I love that neon green! I like reds and purples. my favorite color has always been purple, but I’m finding myself drawn to teals/greens these days. The double friendship star – in reds?? I’m anxious to try this! Congrats on the Fire and Ice award. Love reds of all shades! My favorite color is blue (any shade). Thanks for the great tutorial! Love your Fire and Ice quilt!!! I can’t narrow it down to just one – my favourite colours are pink, orange and purple. (I don’t usually use them all in one quilt!) And I love the more complex stars, especially paper-pieced ones. Thank you for the giveaway! This is a great block. Thank you for making a great block in a great color way. I really like REDS in quilts…and am loving the wonky log cabin star block. That fire and ice is STUNNING!!!! Took my breath away! I love working with reds! I love the color of the Sun fabric, so punchy! It will warm up all of my winter quilt projects! The Cherry color is one that would make a perfect blender for so many of the projects I have planned. Gorgeous! My favorite color is blue and my favorite block is the Hunter’s Star. Thanks for the give away! My favorite color is turquoise, or just blue-green color in general. I just find myself attracted to them! I really like this star tutorial! Today, my favorite color is orange, and I don’t have a favorite star block, but I do like the one you designed for the contest! My favorite color lately is aqua. Thanks! My favorite color is deft blue. Favorite star is the double friendship star. 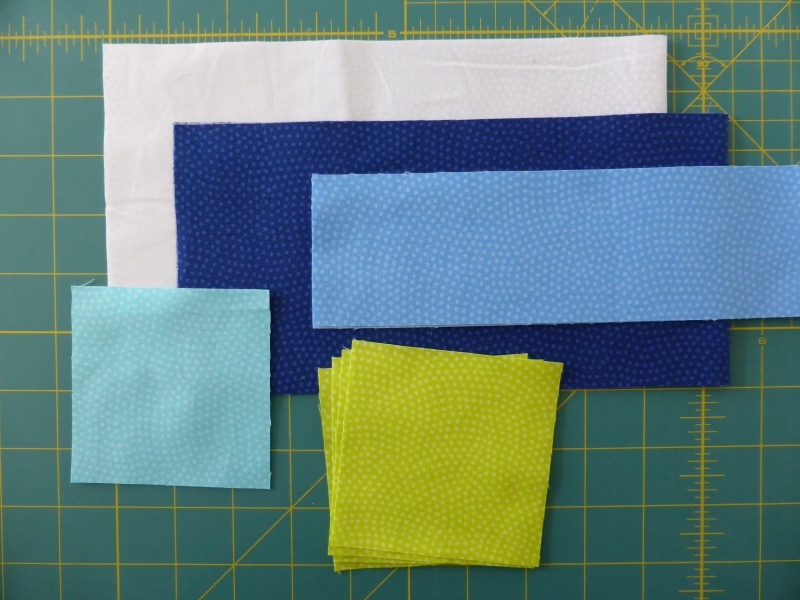 Thanks for the chance to win this fabric bundle! My favorite color is rainbow. My favorite start block is the Lone Star. It sure is hard to pick a favorite star. Ohio star is one. My favorite color(s) are blue and pink. Thanks! I once made a pineapple star block — a big one since it has lots of pieces. I made it into a wall hanging and it is one of my all time favorite quilts I have made. I like many colors, but lately I’m loving everything aqua. 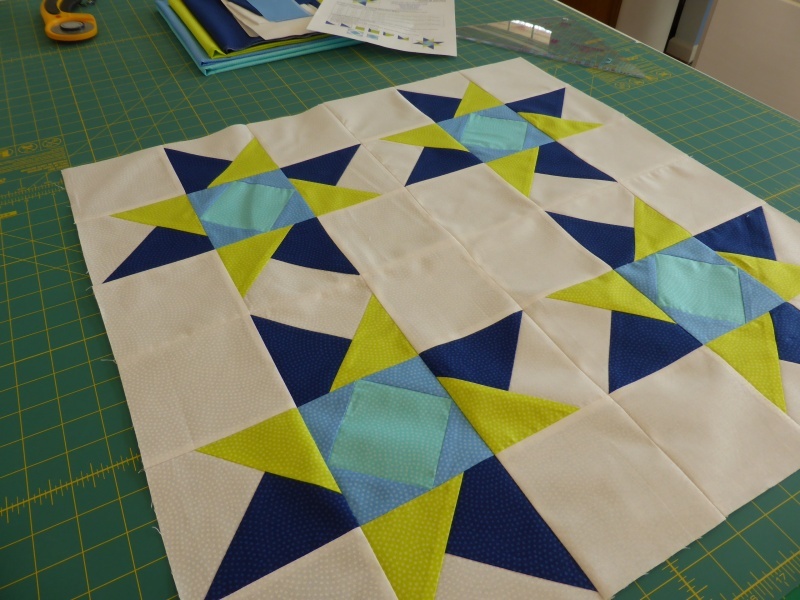 Blue has never been my favorite color but I like the blue green combination I have not made any star blocks but I am going to give it a try. Love your craftsy classes. I love the neon green! This is my first time to your blog your Fire and Ice Quilt is amazing, congratulations on your book also. 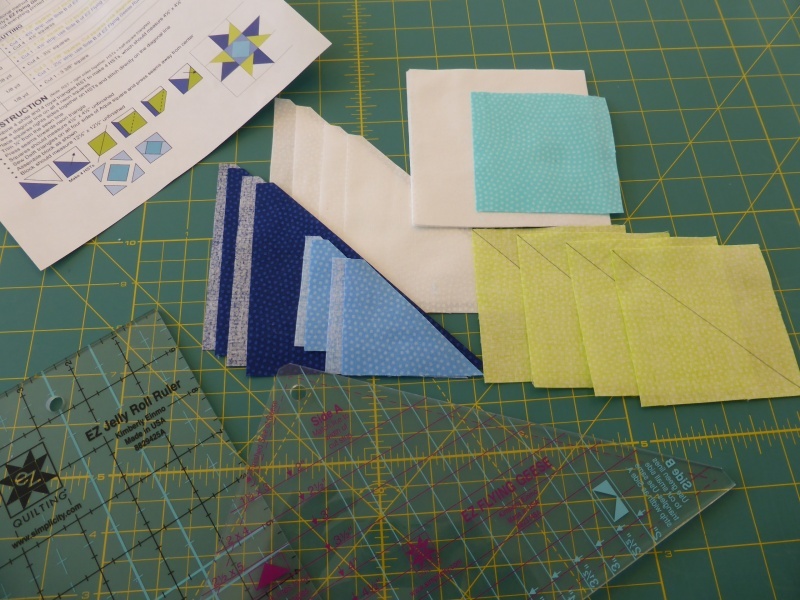 I’m really liking the neon greens and purples…I took your class in Paducah last April and am still making stars! Can’t wait to get your new book!! !